Acute cerebellitis is an inflammatory syndrome occurring most commonly in young children. It is caused by a variety of insults and is usually bilateral. Pseudotumoral hemicerebellitis is an exceptionally rare unilateral presentation of acute cerebellitis mimicking a tumor. Magnetic resonance imaging (MRI) reveals a diffusely swollen cerebellar hemisphere, but with the lack of a well-defined mass, which is hyperintense in T2-weighted images and with pial enhancement in post-contrast images. It typically has a benign course with regression in follow-up scans, thus distinguishing it from a tumor. Recognizing this entity is important because erroneous diagnosis may lead to needless surgical intervention. 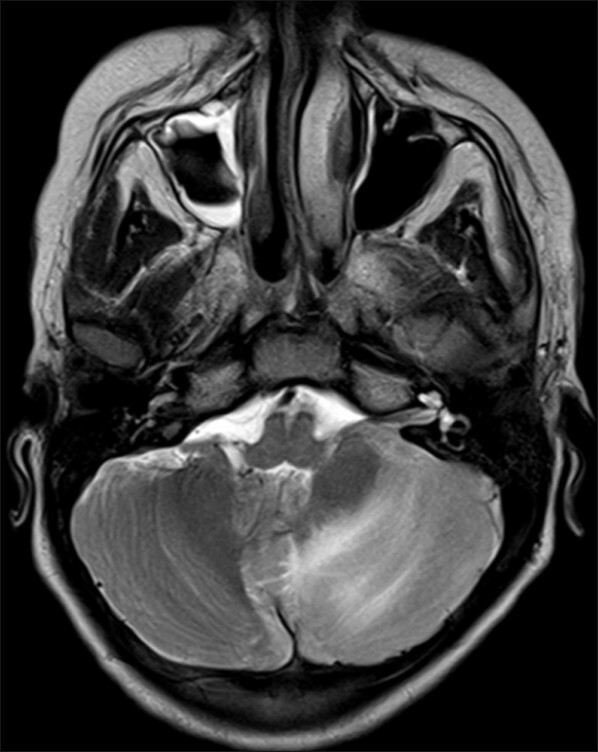 We present a case of pseudotumoral hemicerebellitis in a 12-year-old boy with coagulopathy, with follow-up MRI depicting hemorrhage, and discuss the pathogenesis. We illustrate a single case of pseudotumoral hemicerebellitis with hemorrhage. Computed tomography (CT), MR imaging findings are illustrated and etiopathogenesis is discussed. A 12-year-old male child was admitted to our hospital with complaints of severe headache, vertigo, rash, cough, and recurrent episodes of vomiting. Two weeks before he had fever and was hospitalized in another center with an initial diagnosis of Typhoid fever (Widal positive) and was treated with antibiotics. At admission, patient was febrile, oriented, and conscious. Neurological examination and fundus showed normal results. No signs of meningeal irritation were found. Hematological examination revealed Total Leukocyte Count (TLC) of 5,200/μl with thrombocytopenia (1.1 lakh/mm 3 ). Liver function tests and coagulation profile were deranged. 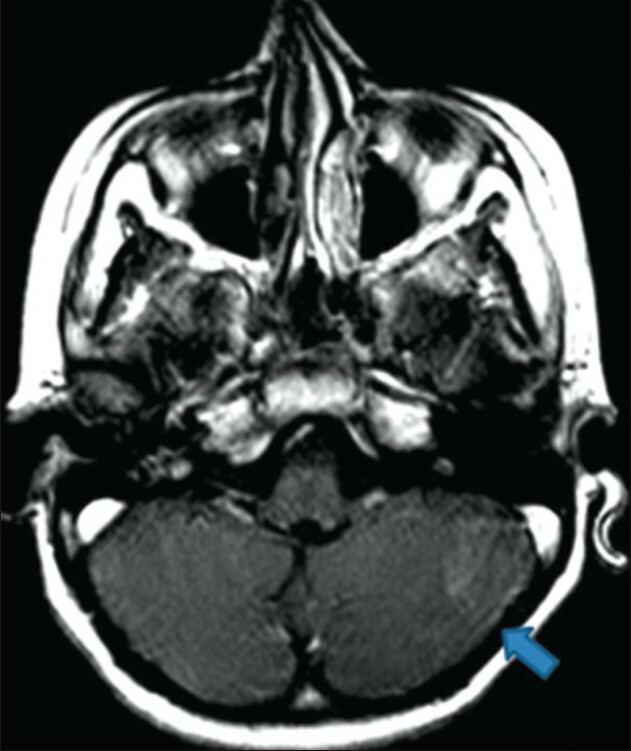 Subsequently, the patient's neurological status deteriorated, and he suffered a single episode of seizure and developed nystagmus. 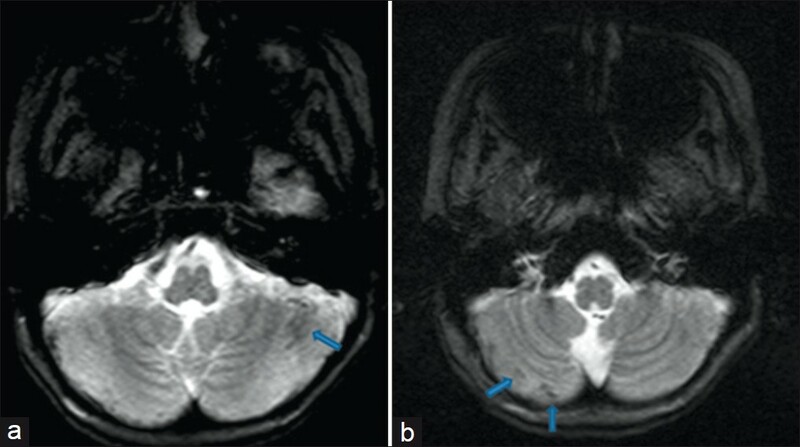 Magnetic Resonance Imaging (MRI) was done, and it revealed a diffusely swollen left cerebellar hemisphere without a well-defined mass, appearing hypointense on T1-weighted images, hyperintense on T2-weighted images [Figure 1], and Fluid-Attenuated Inversion Recovery (FLAIR)- weighted images. There was a significant mass effect over the fourth ventricle and the brainstem with ascending transtentorial herniation and hydrocephalous. No evidence of diffusion restriction was seen. Possibility of hemicerebellitis was considered. The patient was started on antibiotics, acyclovir, and high-dose steroids; also, External Ventricular Drain (EVD) was placed. Cultures and neutrophilic virus antibodies, as well as Polymerase Chain Reaction (PCR) for Herpes and Tuberculosis were negative in the cerebrospinal fluid (ventricular) and blood. Malarial serology was negative. Follow-up contrast-enhanced CT done after a week of initial MRI showed ill-defined non-enhancing hypodense area in the left cerebellar hemisphere with resolution of mass effect. Neurological status gradually improved and repeat contrast-enhanced MRI performed three weeks after admission revealed a decrease in the swelling and mass effect of the left cerebellar hemisphere, without significant atrophy [Figure 2]. Signal abnormalities were much less severe and mild pial enhancement was noted in post-contrast images [Figure 3]. Few linear areas of T1 hyperintensity showing blooming on Gradient Recalled Echo (GRE) images were seen in the affected cerebellum as well as in the contralateral cerebellar hemisphere [Figure 4]. The patient completely recovered and was discharged 4 weeks after admission. Acute cerebellitis is one of the major causes of cerebellar dysfunction in children, which may result from viral or autoimmune etiologies and has a benign course in majority of cases, as was seen in our case. It has an unpredictable clinical course, and while some patients have no symptoms, others may have fulminant course leading to death. Rarely, surgical intervention may be necessary if complications such as tonsillar herniation, brainstem compression, and acute hydrocephalus develop. In this case, as the patient had ascending transtentorial herniation and hydrocephalous, EVD was placed. Our case had typical findings on MRI. On follow-up scans, there was residual T2 hyperintense signal without atrophy. Atrophy and residual hyperintense signal on T2-weighted and FLAIR images may or may not be present in the follow-up scans. , CT may be completely normal or show low-density areas in the cerebellar hemisphere. 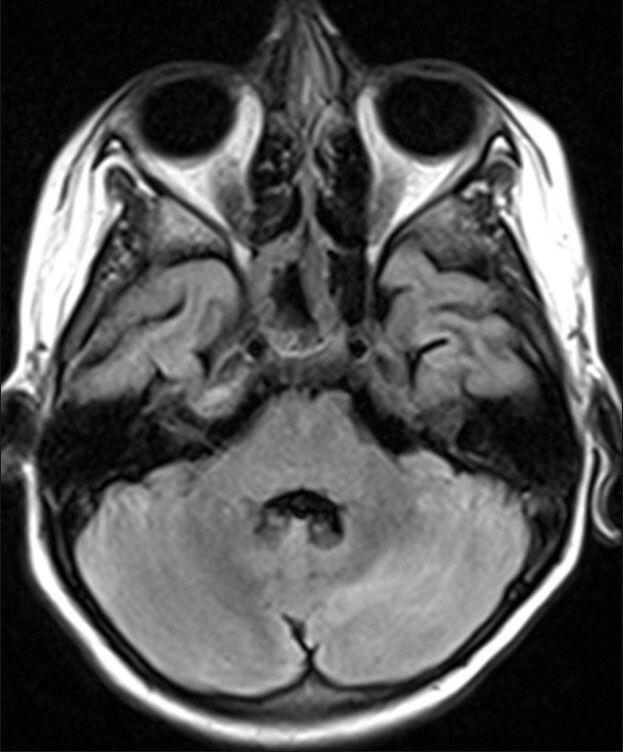 Differential diagnosis includes posterior fossa tumor, acute intoxication, demyelination/Acute Disseminated Encephalomyelitis (ADEM), infarct, and Lhermitte-Duclos disease More Details. ,, Hemorrhage is not a recognized feature of the disease. Although the patient had a deranged coagulation profile, it is unlikely to be the only pathologic factor causing hemorrhage. As the patient had no evidence of bleeding from any other site or in the supratentorial region of brain, the bleed is more likely due to combined effect of direct endothelial injury, sequelae of EVD drainage, and thrombocytopenia. It is difficult to explain the subtle areas of blooming in the normal cerebellar hemisphere, which had no altered signal, swelling, or enhancement in MRI. In a recent study by Oguz et al.,  a case of recurrent pseudotumoral hemicerebellitis was discussed, in which contralateral normal cerebellum had mirror pattern of involvement after 22 months of initial hemicerebellitis. We hypothesize that contralateral cerebellum may actually have mild subclinical involvement in hemicerebellitis, which might manifest later, if certain predisposing factors are present. Further studies are needed to validate these findings. To summarize, serial MRI examinations are necessary in such cases to make the correct diagnosis, evaluate associated complications, and, therefore, avoid needless surgical interventions. In the presence of coagulopathy and other predisposing factors, hemorrhage can occur in the affected as well as normal cerebellar hemisphere. Thus, it raises the possibility of mild subclinical involvement of contralateral cerebellar hemisphere in hemicerebellitis, which may manifest at later stages in the presence of certain predisposing factors. 1. Oguz KK, Haliloglu G, Alehan D, Topcu M. Recurrent pseudotumoral hemicerebellitis: Neuroimaging findings. Pediatr Radiol 2008;38:462-6. 2. De Mendonca JL, Barbosa H, Viana SL, Freitas FM, Viana MA, Ferreira AC. Pseudotumoural hemicerebellitis: Imaging findings in two cases. Br J Radiol 2005;78:1042-6. 3. De Bruecker Y, Claus F, Demaerel P, Ballaux F, Sciot R, Lagae L, et al. MRI findings in acute cerebellitis. Eur Radiol 2004;14:1478-83. 4. Levy EI, Harris AE, Omalu BI, Hamilton RL, Branstetter BF 4 th , Pollack IF. Sudden death from fulminant acute cerebellitis. Pediatr Neurosurg 2001;35:24-8. 5. Montenegro MA, Santos SL, Li LM, Cendes F. Neuroimaging of acute cerebellitis. J Neuroimaging 2002;12:72-4.